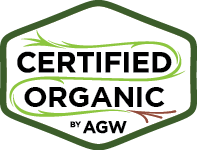 Certified Non-GMO by AGW represent the clearest standards for Non-GMO certification. The seal may be applied to raw materials and finished products only once a valid certificate has been issued. Category 1: Products that contain no animal products. Category 2: Products that contain any animal product. For Category 1 certification the following Certified Non-GMO by AGW program standards must be met. For Category 2 certification, when a product contains or is derived from any animal products, the livestock they originate from must also be approved under the Certified Animal Welfare Approved by AGW species-specific standards. 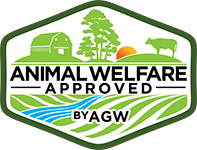 Non-Animal Welfare Approved by AGW livestock farmers are not permitted to apply to the Certified Non-GMO by AGW program prior to Certified Animal Welfare Approved by AGW program application; however, applications may occur simultaneously. For information on animal management, health care, pasture management, housing and shelter, transport and other requirements please see the Certified Animal Welfare Approved by AGW standards for individual species at https://agreenerworld.org/certifications/animal-welfare-approved/standards/. The Certified Non-GMO by AGW standards apply to all livestock that produce the meat, dairy, fiber and eggs that are to carry certification, the crop species that are grown on- and off-farm to feed them and the inputs used to produce both the crops and the animals. On August 19, 2016, FSIS issued Notice 54-16, which approves the use of “Non-GMO” labeling of meat, poultry and egg products verified to be produced without the use of bioengineered ingredients. Upon completion of the Certified Non-GMO by AGW approval process, successful applicants may choose to use the term “Non-GMO” or “Non-GE” under the Certified Non-GMO by AGW module on product labels (see Standard 18.8.1). 18.0.1 Certified Non-GMO by AGW meat products from cattle, sheep, goats, pigs and bison must come from animals whose mothers were managed to these standards from at least the last third of gestation onwards. 18.0.2 Certified Non-GMO by AGW dairy products must come from animals that have been managed to these standards for at least 12 consecutive weeks prior to certification. 18.0.3 Certified Non-GMO by AGW meat products from poultry must come from birds that were managed to these standards from hatch onwards. 18.0.4 Certified Non-GMO by AGW eggs must come from poultry are have been managed to these standards for at least 12 consecutive weeks prior to certification. 18.1.1 Certified Non-GMO by AGW products must be produced without the use of Genetically Engineered products (GMOs). 18.1.2 Certified Non-GMO by AGW products must be free of contamination from GMOs. Note: There must be no contamination with GMOs during production, processing, storage and transport of feed, other inputs or livestock products. 18.1.3 Livestock must not be fed grains, concentrates, supplements, vitamins, minerals, feed additives and carriers containing GMOs. 18.1.4 The use of fertilizers containing GMOs or their derivatives must not be used on crops or range/pasture land used for feeding and raising livestock that will produce Certified Non-GMO by AGW meat, milk or eggs. Note: Examples of non-compliant fertilizers are plant-based fertilizers derived from GMO crops – e.g. oil cake from GMO canola. Composts and manures derived from animals fed GMO feeds are not included in this standard. 18.1.5 The use of pesticides containing GMOs or their derivatives must not be used on crops or range/pasture land used for feeding and raising livestock that will produce Certified Non-GMO by AGW meat, milk or eggs. 18.1.6 The use of inoculants containing GMOs or their derivatives is prohibited for any crops or feedstuffs for livestock that will produce Certified Non-GMO by AGW meat, milk or eggs. Note: Inoculants for hay, silage and baylage and rhizobium inoculants may contain GMOs. 18.1.7 Veterinary and health care products containing GMOs or their derivatives are prohibited. This includes the use of medicines, vaccines, and parasiticides. 18.1.8 If there is no alternative to the use of a veterinary or health care product that contains GMOs or their derivatives, the animal must be treated, the treatment must be recorded and the meat, milk or eggs from that animal must not be sold under the Certified Non-GMO by AGW label. 18.2.1 Each operation must have an implemented, written statistically valid sampling and testing protocol, that provides at least 90% confidence in quantifying GMOs to the threshold levels specified in standard 18.4.9. 18.2.1.1 The feeds and other inputs used by the farm in the production of Certified Non-GMO by AGW meat, milk and eggs and their source. 18.2.1.2 The types of testing used by the farm (i.e. qualitative or quantitative, strip tests, PCR tests) and which tests are used for which products and why. 18.2.1.3 The frequency of testing. 18.2.1.4 The tolerances for detection of GMOs and the action taken when samples exceed these. Note: Farms that only have low risk feeds and inputs – for example farms that only have pasture or rangeland and only have Certified Grassfed by AGW livestock – do not need to have a testing protocol. 18.2.2 The testing protocol must be reviewed and revised as necessary at least annually. Note: the type of testing protocol must be matched to the potential risk. Note: An example of a low risk product would be crops grown by a neighbor with no surrounding GMO crops of the same species or any other risk of contamination with GMO crops. 18.3.2 Qualitative PCR tests can only be used as the sole test for products deemed to be low to moderate risk. Note: Qualitative tests determine whether or not GMO DNA is present or absent in a sample. 18.3.4 If strip tests or qualitative tests prove positive, the samples must be submitted for quantitative PCR testing. Note: Quantitative tests provide an assessment of the level of GMO DNA in a sample. 18.3.5 Quantitative PCR testing must be used for products deemed to be high risk that are grown, fed or otherwise used for the production of Certified Non-GMO by AGW meat, milk or eggs. 18.4.1 If there is a risk that products used to produced Certified Non-GMO by AGW livestock products are GMO or are contaminated by GMO, samples must be tested. Note: This could include products that are otherwise classed as “low risk” that have (for example) come from sources with previous contamination incidences. If a viable commercial test is not available, other forms of validation may be considered on a case by case basis. 18.4.2 Testing of high-risk inputs, or products containing high-risk inputs when those are accompanied by valid Non-GMO documentation must occur at least quarterly. 18.4.3 Testing of high-risk inputs or products containing high-risk inputs that are not accompanied by valid Non-GMO documentation must occur with every batch bought. 18.4.4 Testing using equipment owned by the farm or farmer group is permitted. However, risk products must be tested at least annually by a laboratory certified to ISO 17025, using methods within the scope of that accreditation. Note: The auditor will collect random sample(s) at initial or annual audit, spot audit or other unannounced visits and submit these for laboratory testing. The number of samples will depend on the number of risk ingredients and storage points on farm. 18.4.5 Anyone carrying out testing must be trained and tested in the particular method of testing in use. 18.4.6 Every at-risk seed lot should be tested annually via a PCR test done on a representative sample of 10,000 seeds. 18.4.7 If high-risk products are imported onto the farm, whether as individual products or as part of a blend, a Non-GMO declaration must be provided by the supplier. Note: A Non-GMO declaration does not replace the requirement to test. 18.4.8 High-risk products may be downgraded to low risk on a case by case basis in certain circumstances. Note: For example while soy is a high-risk product, certified organic soy is likely to be lower risk than non-organic soy. Note: If the presence of GMO material is deliberate or could have been avoided, there is no tolerance for any contamination. 18.5.1 If you are a new applicant you must inform Certified Animal Welfare Approved by AGW if you have grown any GMO crops in the last three years. 18.5.2 To prevent contamination you must not grow a GMO crop of the same species as any Non-GMO crops on any part of a farm or group of farms you own or manage. 18.5.3 Any GMO crops grown on any part of a farm or group of farms you own or managed must be declared annually to Animal Welfare Approved by AGW. 18.5.4 Certified Animal Welfare Approved by AGW must be informed if the farmer is aware of any GMO crops of the same species as their Non-GMO crops being grown on neighboring land. Note: The wind and bees may carry GMO pollen that can cross-contaminate Non-GMO crops. 18.6.1 Dedicated Non-GMO equipment and facilities for harvest, cleaning, storage and transport must be used when available. 18.6.2 If dedicated Non-GMO equipment and facilities for harvest, cleaning, storage and transport are not available, there must be documented cleaning procedures between use for GMO or potential GMO crops and use for Certified Non-GMO by AGW products. 18.6.3 Corn for use (e.g. as animal feed) for any Certified Non-GMO by AGW product must not be grown alongside any known crops of GMO corn. Note: The definition of “alongside” for this standard is a field that shares a boundary with any field used to grow GMO corn. 18.6.4 Corn for any Certified Non-GMO by AGW product should be grown a minimum of two miles from any known crops of GMO corn. Note: Pollen from GMO corn can travel a long way and Non-GMO corn crops should be grown as far away from GMO corn crops as possible. 18.6.5 Corn for use for any Certified Non-GMO by AGW product should be planted at least a week apart and preferably three to four weeks apart from any known GMO corn crops so pollination takes place at different times. Note: Soy is considered a low-risk candidate for contamination, as it is a self-pollinating crop. In addition, pollen from soybeans is too heavy for wind transport. Any volunteers, feral populations, and/or wild relatives of Certified Non-GMO by AGW crops must be controlled when these occur in proximity to the Non-GMO crop. 18.6.8 When pollinators are rented, Certified Non-GMO by AGW farms must ensure that these have not previously been used that season in proximity to fields where GMO crops were grown. 18.7.1 Further processed products labeled as Certified Non-GMO by AGW must not contain any GMO ingredients, flavorings, seasonings, colorings, additives or any other substance present in the final product. 18.7.2 A further processed product must not make any claim to contain Certified Non-GMO by AGW products unless the entire finished product is Certified Non-GMO by AGW. 18.7.3 There must be records for each batch of Certified Non-GMO by AGW further processed product covering amount, source and non-GMO status of all ingredients used. 18.8.1 Products approved under the Certified Non-GMO by AGW module can be labeled as Non-GMO* or Non-GE*. 18.8.3 The phrases “no GMOs”, “no GEs,” contains “zero GMOs,” and contains “Zero GEs” must not be used. 18.9.1 A complaints record relating to complaints about Certified Non-GMO by AGW certified livestock or products must be maintained and be available at annual inspection. The record must list both the complaint and the action taken by the farm or business. 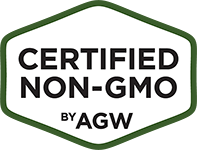 Note: Certified Non-GMO by AGW is accredited to ISO 17065 and it is a requirement of our certification that those within the program maintain a record in the rare event that any complaint is made. 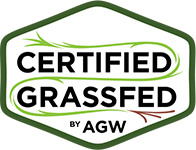 Certified Non-GMO by AGW does not expect that farms or other businesses in the program will receive complaints about their certified livestock or products, but if any are received they must be recorded along with the response from the farm or business. High-risk products are those products that are genetically modified and grown on a large scale. High-risk products include the following crops that are commonly found in animal feeds either as the harvested crop or as a by-product. High-risk products also include the following, though these are much less likely to be found in feed or other inputs or additions to Certified Non-GMO by AGW livestock products. Low risk products are those for which no genetically modified version is known, or where the only genetically modified versions are used solely in controlled/laboratory conditions and are not in commercial use and where there is no risk of cross-contamination with other GMO crops. Protecting Organic Seed Integrity: The Organic Farmer’s Handbook to GE Avoidance and Testing Organic Seed Growers and Trade Association. 18.4.4 Testing using equipment owned by the farm or farmer group is permitted. However, risk products must be tested at least annually by a laboratory certified to ISO 18025, using methods within the scope of that accreditation.